What’s coming in health and human services? No one knows exactly. The past few months have been a whirlwind of headlines on the new administration, health care reform legislation, and newly issued rules. My colleague, Monica E. Oss has written before about the importance of planning for unknown scenarios and what that plan should include (see Considering Future Scenarios: The OPEN MINDS Guide To Scenario-Based Planning). This plan should include optimizing the current market situation, planning for future scenarios, and most importantly, planning for the turbulence and disruption of getting from here to the future. But what does planning for turbulence look like in practice? Peggy Chase, President and Chief Executive Officer of Terros Health, presented a great example of this at The 2017 OPEN MINDS Management Best Practices Institute. In the session, Planning For Turbulence In The Years Ahead: How To Diversify Your Revenue Streams & Develop Marketable New Services, led by OPEN MINDS Senior Associate, Joe Naughton-Travers, she outlined Terros’s path of evolving from a traditional CMHC to a whole health provider of primary care and behavioral health services. Over the past six years, Terros has grown from a $32 million behavioral health organization to an $84 million comprehensive health care organization. The change in size is a reflection of a successful strategy to adapt to the changing Arizona market. How did they accomplish this shift? First the state planned to integrate the Department of Behavioral Health into the Arizona Health Care Cost Containment System (the state Medicaid agency) changing how services were administered (see Governor Ducey’s Administrative Simplification Initiative Bringing Together the Division of Behavioral Health Services and AHCCCS). The second and much larger change, is the state’s plan to move from a behavioral health carve-out to a carve-in through the issuance of an integrated contractors RFP (see Arizona Medicaid To Integrate Behavioral Health Into Managed Care, Including Autism & Children’s Rehabilitation Services). 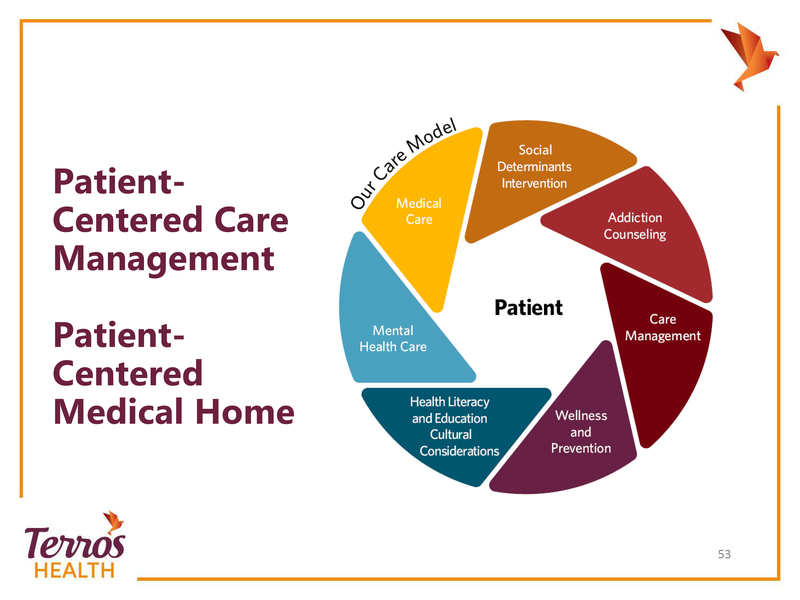 In the face of the environmental changes affecting the Arizona market, Terros decided to become a behaviorally-led medical home that focused on the whole person. This in turn led to becoming a federally qualified health center look-alike, meeting NCQA national health care standards, and finally applied for patient-centered medical home recognition. To complete these changes, Ms. Chase talked about the major obstacles the organization had to overcome, including financing, staffing, and changing internal processes. Financing – As a non-profit organization in Arizona, Terros is limited to 4% net profit and had to think creatively about financing. To implement their initial changes, the organization received a small planning grant through the Substance Abuse and Mental Health Services Administration (SAMHSA). They also worked to streamline and find efficiencies in delivering their current service lines. Ms. Chase explained a big part of that was making sure clinical professionals were operating at the top of their licenses. By changing how they were spending their dollars, Terros was able to invest in transformation. Staffing – Terros knew that a big cultural and service line shift would result in changes in staffing and the organization worked to minimize this disruption. First they built staffing losses into their financing model, predicting 25% turnover – actual turn over turned out to be much higher at 35%. To combat the loss of staff, the organization completed a lot of planning, added positions into position control, and hired people ahead of anticipated losses. Today the organization has adopted a staffing model that focuses on lean processes, management protocols, accountability, and results. Changing internal processes – Finally, the organization had to make a lot of internal changes as well. To do this, Terros appointed a chief transformation officer, whose job is to lead change and improve processes. 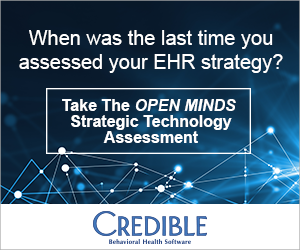 Changes the organization has made in the past six years include switching from an EHR to EMR; implementing roster management, common language, and medical practice management workflow; adding a credentialing team; and moving to a payer relations focus. Today the organization continues to make changes, such as improving their initial patient engagement numbers. Planning and implementing changes for turbulent times can feel like a heavy lift. The key is knowing whether those changes make sense from the outset, using a feasibility analysis, and then creating stop gaps throughout the planning and implementation process. Ms. Chase explained that when Terros started six years ago, they had 30 initiatives on their list and they have now completed 28. The two initiatives that are not completed were those that the organization decided not to pursue. For more on implementing change in your organization join us at The 2017 OPEN MINDS Executive Leadership Retreat for the session, “Positioning For Success – General John Buford & The High Ground: The Beginning Of The Battle Of Gettysburg,” led by Ken Carr, Senior Associate, OPEN MINDS and Robert Prosperi, Licensed Battlefield Guide, Gettysburg. The session uses the history of the Battle of Gettysburg to provide an interactive look at how leaders can be positioned and prepared for challenges ahead.